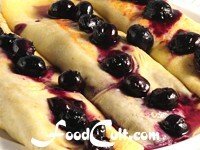 Crepe Fillings and Garnishes - Free, Easy Recipes @ FoodCult.com - A Place for Galganov's Recipes and More - Food Matters! We like to mix up a big batch of crepe batter and make our crepes in advance - filling a few at a time as our tastes dictate. In some cases such as making cheese blintzes or Polish croquettes we'll make up a big batch of crepes and roll up lots at a time freezing the finished blintzes or croquettes for later use. Occasionally, we will roll up a big batch of crepes with an "in-season" filling (such as apple or blueberry) and freeze those for easy, later use. While blintzes (or "belinis" as some would know them) and Polish croquettes generally use a milkier crepe (you may find this milkier crepe recipe with the cheese blintze recipe) the crepe recipe on this site will also work marvelously well! Crepes and Pancakes - More Than Just Breakfast! Crepes, like conventional pancakes (also known as griddle cakes or flapjacks) can be a full breakfast or even part of a wonderful, celebratory brunch ... and just like that conventional pancake, the crepe can be a perfect midnight snack. The most famous crepe is, of course, the Crépe Suzette. The beautiful thing about crepes is their versatility. They can be used for more than a simple crepe. The limit to stuffing your crepe - is your imagination!